The 8th Dato Arthur Tan Malaysian Open was held between August 18th to 25th in Cititel Midvalley Hotel, Kuala Lumpur, Malaysia. 98 players from 22 federations took participation in the 9-round event. 12 Grandmasters and 17 International Masters joined the competition. China’s GM Li Shilong emerged clear winner with 7.5 points out of 9, half a point ahead of his nearest rivals. 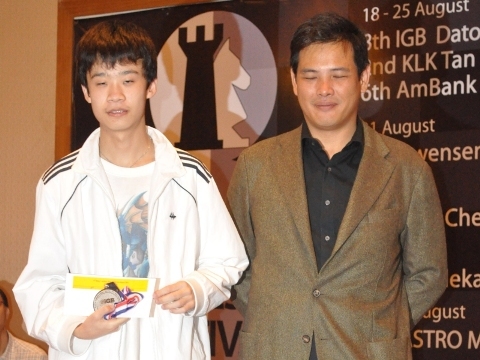 He led for the later half of the tournament and could relax with a draw in the final round to clinch the championship. It was a Chinese affair with the 2nd place till 6th place taken by IM Lu Shanglei, GM Wen Yang, Wan Yunguo, GM Wang Rui and WGM Ju Wenjun respectively. There follows a group from the Philippines. IM Lu Shanglei’s performance was good enough to earn him a GM norm. 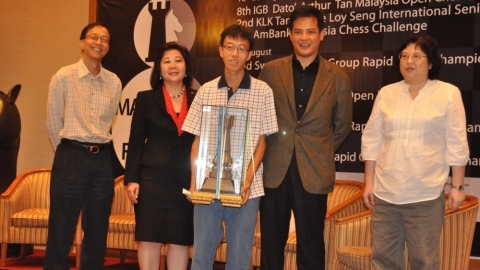 The Malaysian Open is part of the Malaysian Chess Festival which runs until the end of August. News by Andrew Ooi.